In his upcoming exhibition 'Home Within Home,' Do-Ho Suh illuminates the physical and abstract associations which make a home a home, by constructing dwellings which stray from usual expectation. His unorthodox architecture illustrates how our memory of space affects space itself. In 1991 Suh moved from Soeul, Korea to Rhode Island, and has since been travelling back and forth between his family in Korea and his work in New York. 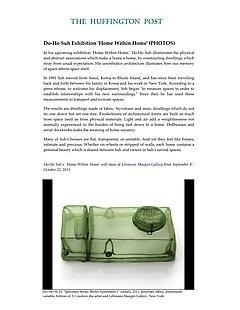 According to a press release, to welcome his displacement, Suh began "to measure spaces in order to establish relationships with his new surroundings." Since then he has used these measurements to transport and recreate spaces. The results are dwellings made of fabric, Styrofoam and resin, dwellings which do not tie one down but set one free. Exoskeletons of architectural forms are built as much from space itself as from physical materials. Light and air add a weightlessness not normally experienced in the burden of being tied down to a home. Dollhouses and serial doorknobs make the meaning of home uncanny. Many of Suh's houses are flat, transparent, or unstable. And yet they feel like homes, intimate and precious. Whether on wheels or stripped of walls, each home contains a personal beauty which is shared between Suh and viewer in Suh's carved spaces.